I confess to being a maker of lists. While some people count sheep, I might be working out my top ten bands that I have yet to see, or my top ten unvisited destinations in Europe. Barcelona is still leading, but Istanbul is challenging. 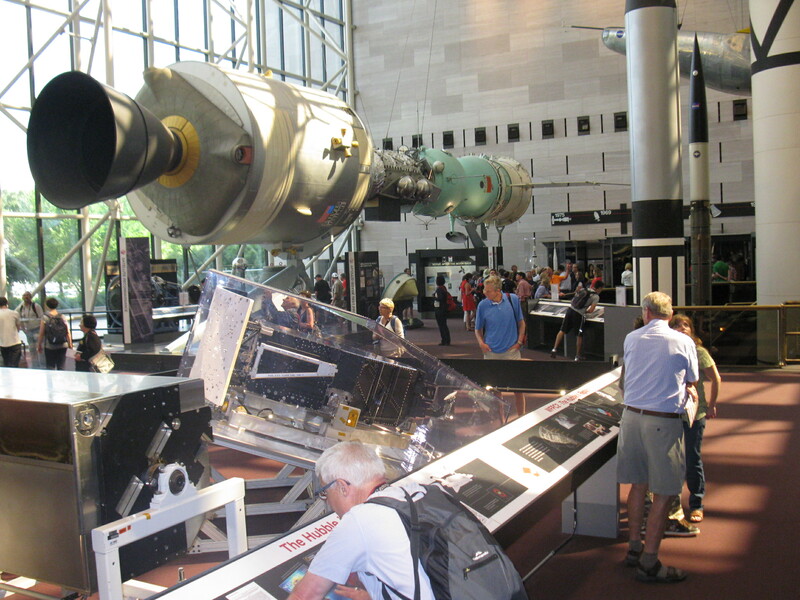 Washington has been heading my “cities yet to visit in the US” for several years, and in the sub-list of attractions that Washington has to offer, the Smithsonian’s National Air and Space Museum is right at the top. Yesterday’s exertions have taken their toll on Mum. We wandered from Washington State University and the Watergate complex, around the Potomac, visiting a string of monuments and memorials, before finally heading home. It was a beautiful walk, but as we reached the hotel, I realised that Mum was now smiling because the end was in sight. As soon as we arrive at the Air and Space Museum today, Mum knows that she’s not up for this, and we get her a taxi back to the Hotel. 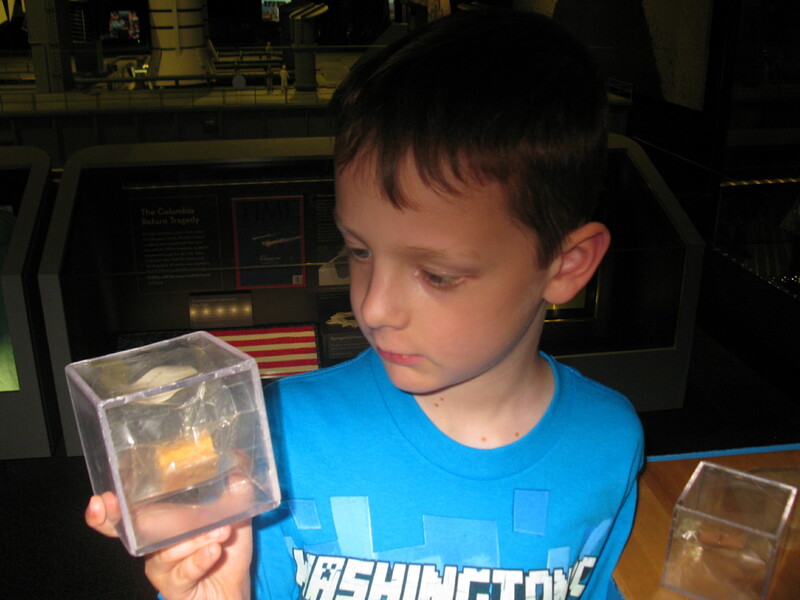 So today is just me and my boys, and the Air and Space Museum isn’t such a bad place for a Dad’s day out. I find myself quickly reverting to the ten-year old kid who would constantly have books on Space out of the local library, and who would cut pieces of cardboard and paper into the shape of Saturn to write his own guide to the Solar System. The Solar System had a lot fewer moons in those days. Fortunately, Sam is just as hooked as I was. 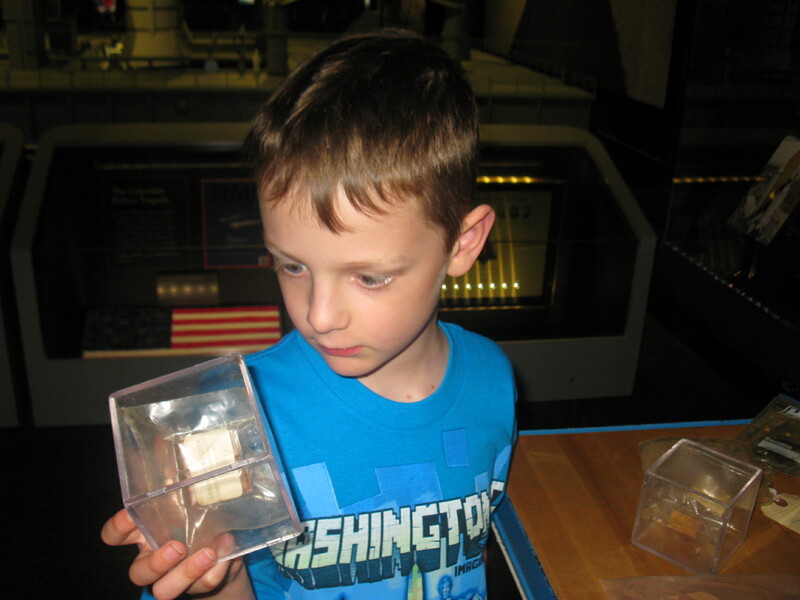 If I don’t recognize something in the museum, it’s quickest to ask him, and he’s generally right. Dominic’s getting into this too. He may be two years younger than Sam, but he’s old enough to know that he doesn’t have a choice. Our first half hour is spent bouncing from exhibit to exhibit, spending barely enough time to take a photo, before being distracted by something equally as fascinating. We pause for breath, plan our day and decide to start with a space documentary at the Einstein Planetarium. We’ve seen many similar movies at our local planetarium in Auckland, but this is on an entirely different scale. One aspect it does share with its poorer New Zealand cousin is its ability to put me to sleep soon after the movie starts. This is no reflection on the quality of the show; those seats are just so comfortable. Through the movie my head is constantly gently dropping before suddenly jerking back up. My kids just shake their head – they’re not angry, just disappointed. But I can recommend the movie – well, I enjoyed the opening and closing credits. It’s time to tackle the museum again. This time our circuit of the two floors is much more orderly – we even read some of the signs. Everything of major and minor significance is here. And if it isn’t here, there’s usually a good excuse – like it’s on Mars or some other inconvenient location. In that case, there’s a test version or other replica. 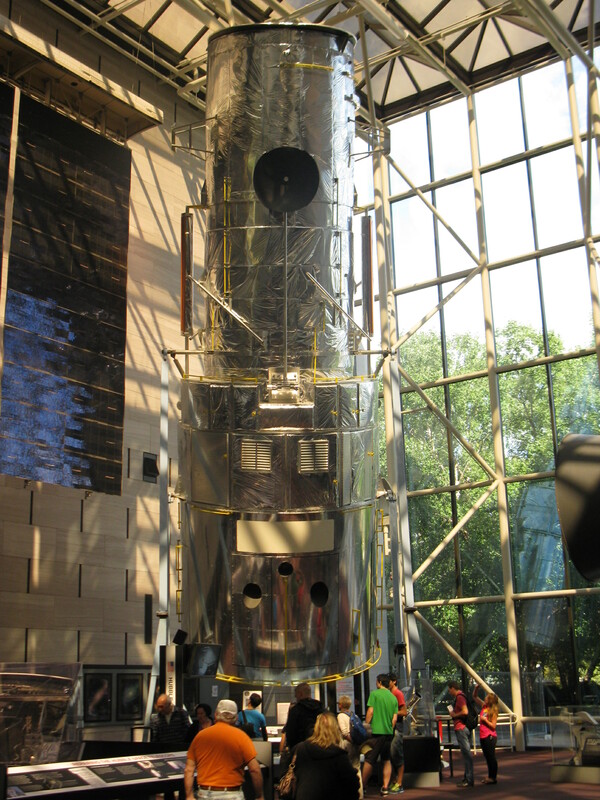 We’re surrounded by the history of space exploration, starting with Ptolemy’s Model of an Earth-centred universe and many historic artifacts, through the Mercury, Gemini and Apollo programs, to moon rock you can touch, and replicas of Skylab, the Hubble Telescope, and Mars rovers. I could list many more, but these guys do it so much better. 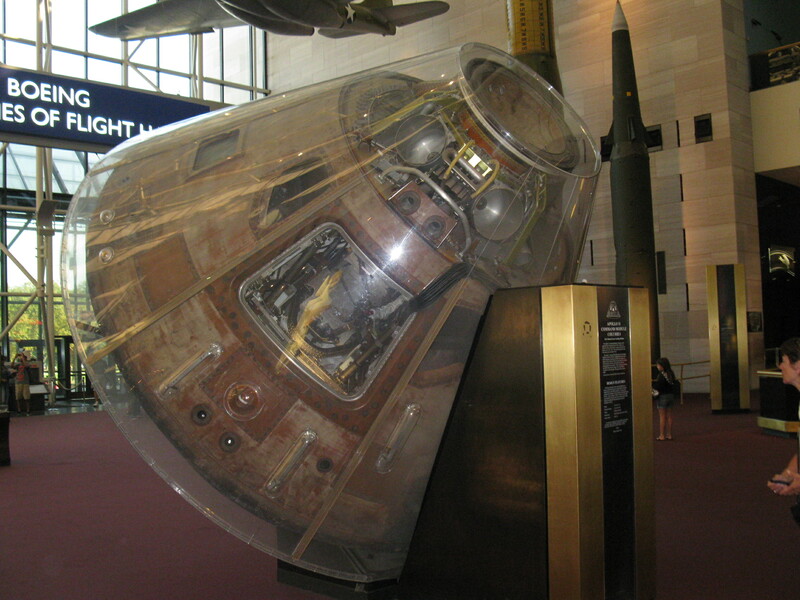 Friendship 7, Mercury Program. 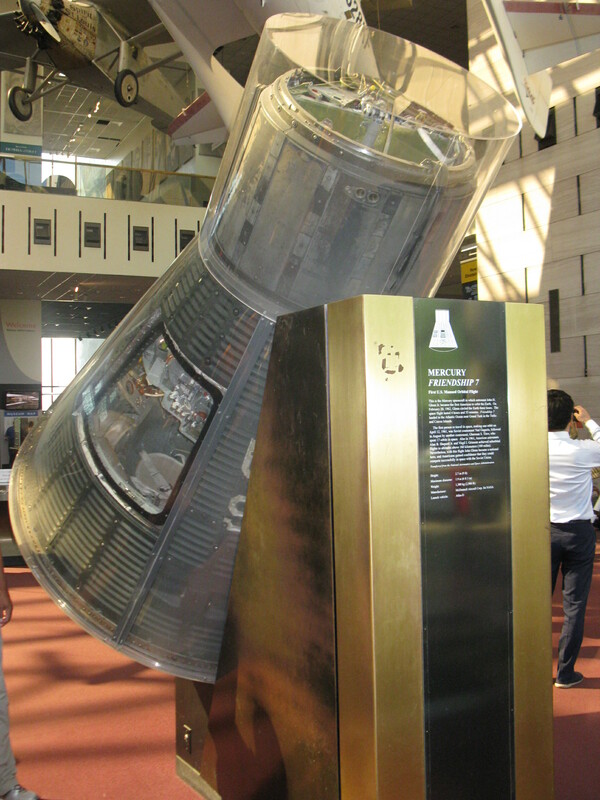 In 1962 Glenn became the first American to orbit the earth aboard this craft. 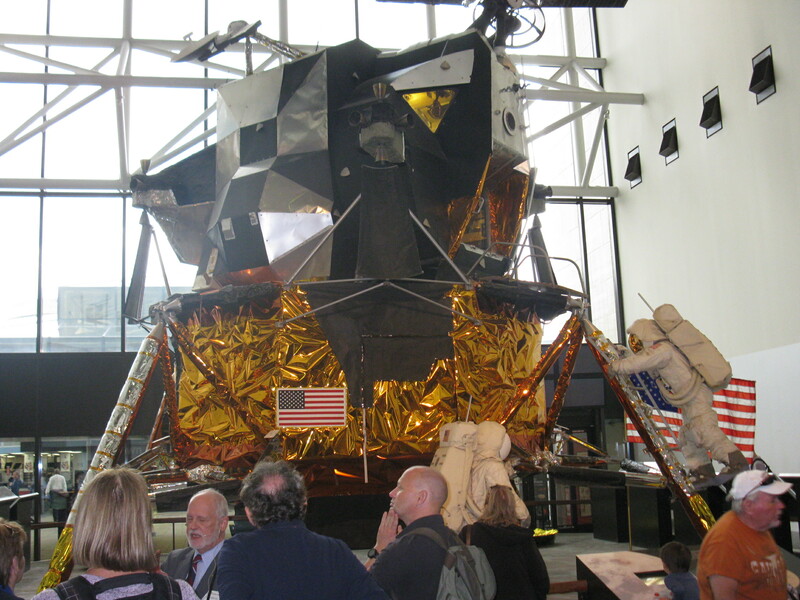 Columbia – brought back Armstrong, Aldrin and Collins safely back to Earth and 1969 lunar landing. 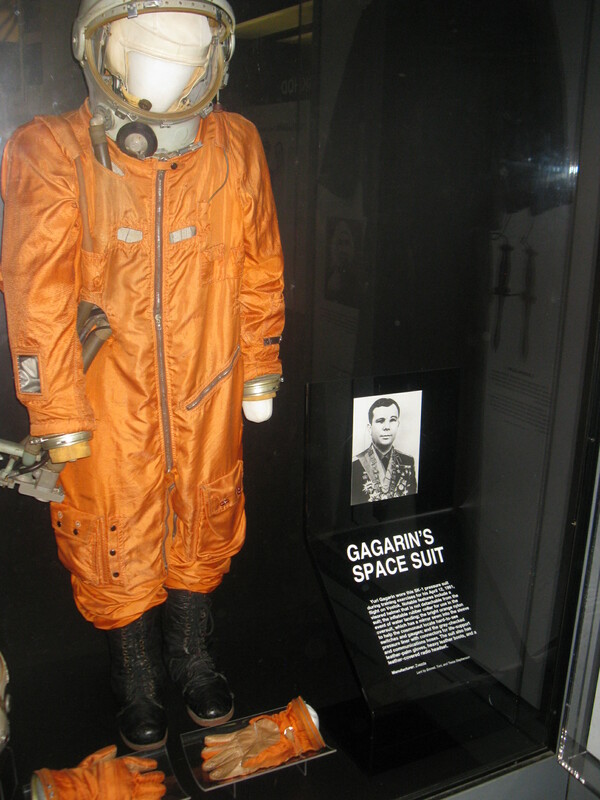 Yuri Gagarin’s test suit in preparation for his journey aboard Vostok 1 in 1961, to become the first man in space. 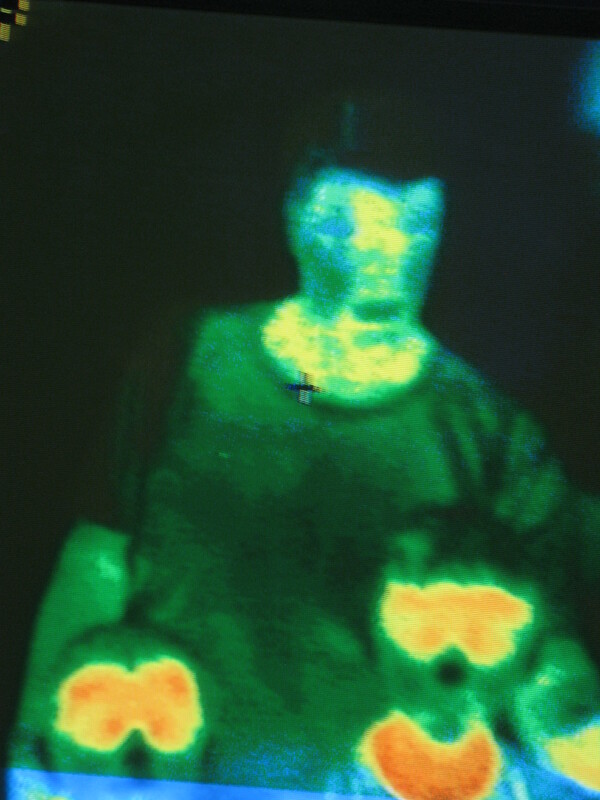 So why is my head blue and the kids’ heads are yellow? 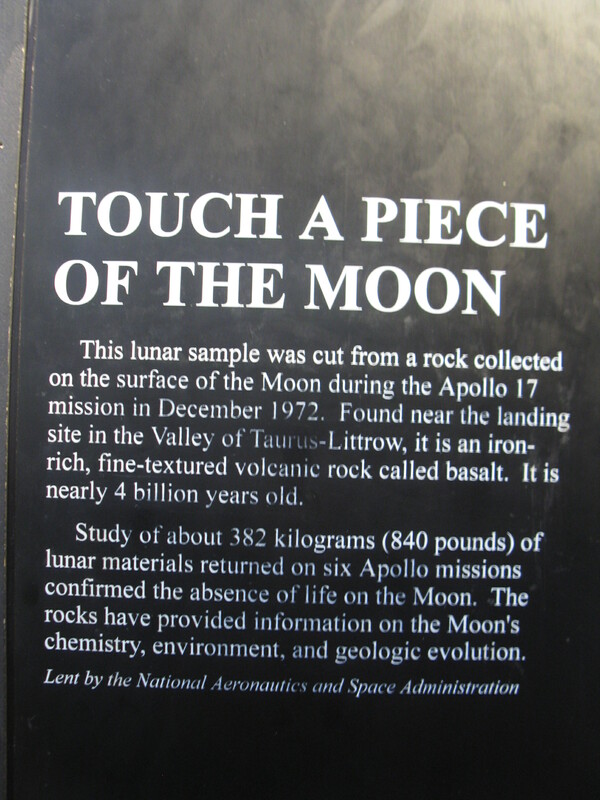 For the record, the moon is very smooth, but that could be more due to the millions of fingers that have rubbed this sliver of moon rock 70215 since it was loaned by NASA to the National Air and Space Museum in 1976. Despite all that handling, it’s not looking a day over 3.7 billion years old. 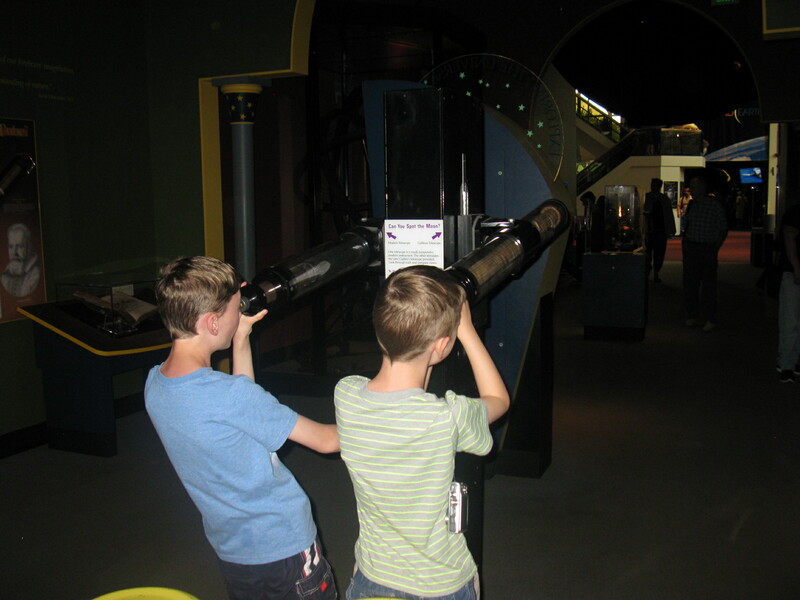 Being eight and ten year old boys, Dom and Sam are impressed by many exhibits, but don’t see what the fuss is all about with others. The Spirit of St Louis in the central hall is just like theirs, except this one is bigger and not made of Lego. 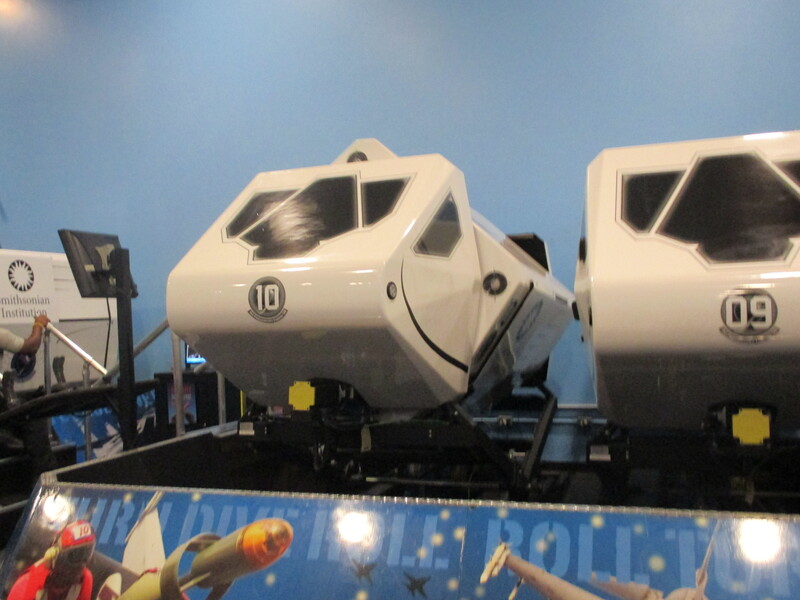 They’re in agreement about the importance of trying the simulators though, and just in case we experience a bumpy flight, I suggest we do this before lunch. Simulators! They even work upside-down. Our instructor mentions how to spin the plane, which sounds like fun. Dom and I take the first turn, and I soon accidentally send us spinning. Dom isn’t thrilled, and he can be heard all over the museum yelling “Put it back Dad!! I’m having a heart attack!!! Dad!! 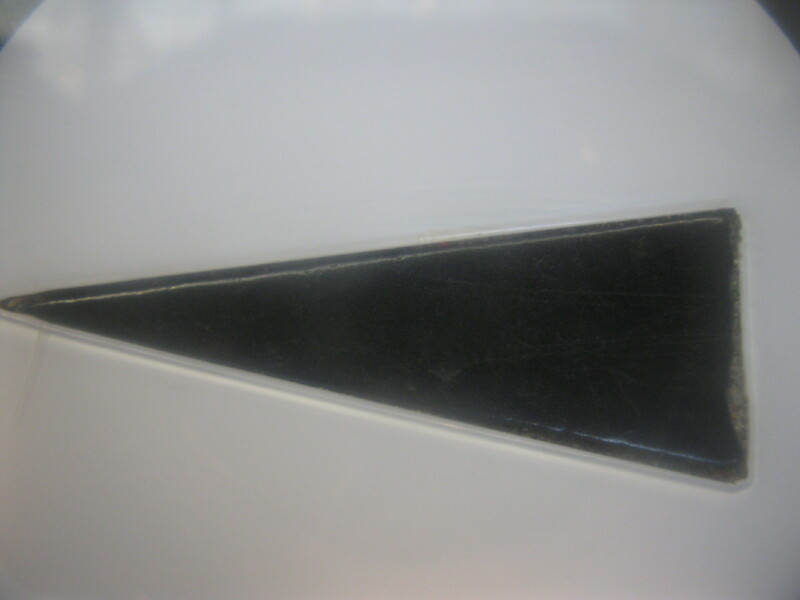 You are the worst simulator pilot ever! !” To be fair to Dom, we do spend quite a bit of time in the plane hanging upside down, but he may not get too many chances to do that in a plane. He’s very relieved when the door slides open, and we’re greeted by many onlookers curious to see what I was doing to my son. When Sam takes his turn, he takes the pilot’s seat, and it’s smooth sailing all the way. Where’s the fun in that? Space version of crackers and cheese. Not impressed. 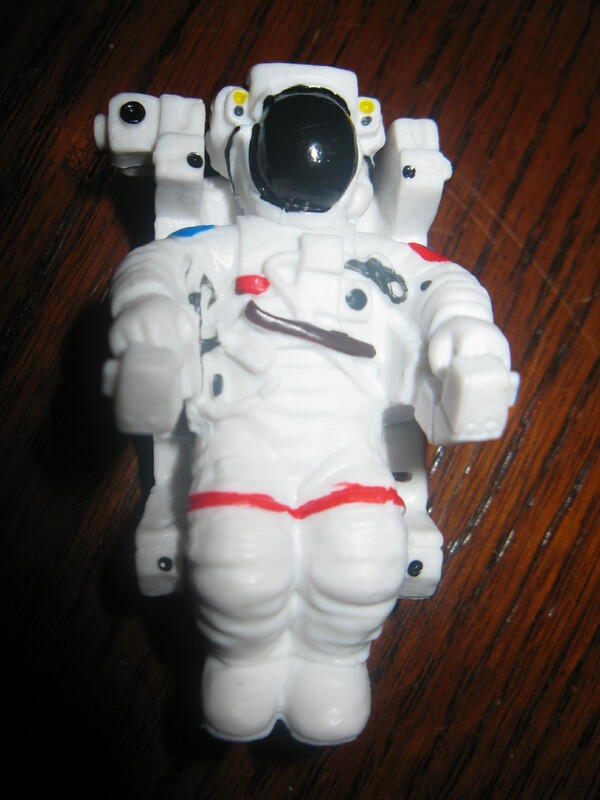 Dom isn’t impressed by what passed for Astronaut food during the Apollo program, but that reminds us that we need to eat. We check out lunch choices and find that the options that aren’t McDonalds are all full, so we head off in the opposite direction looking for golden arches. What we find in the courtyard outside is a small caravan with the McDonalds logo attached, with a few tables under umbrellas. There’s also a grassy area with trees and bushes, separated from the courtyard by a long wall at just the right height for boys to sit on. Most importantly, it comes with fresh air, and it’s a beautiful day. We’re trying to resist the fast-food temptation on this trip, but today seems a worthy exception. We take our place sitting on the wall, and we soon notice a rustling in the bushes behind us. A very huge and very well fed rat scampers out of the bushes, looks at me, my kids, and our lunch and swiftly retreats. I’m not sure whether he’s sick of McDonalds and is hoping for something different. A shriek comes from the bushes followed by more rustling. Either our rat is having an argument with his neighbour, or he’s not taking at all well the idea of McDonalds for lunch yet again, Once more he scurries out, eyes us up, and darts back into the bush. More shrieking. This animal definitely has anger management issues. I’ve never seen my kids interact with rats. They’re not afraid, so I feel the need to remind them to keep their distance, and that I bought those fries for them, not our furry friend. 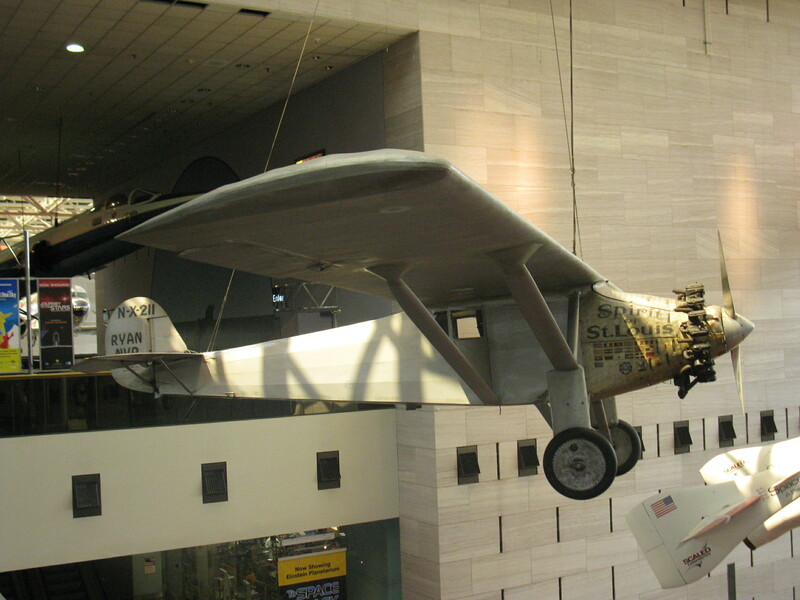 Charles Lindbergh’s Spirit of St Louis, flown from New York to Paris, May 1927. Good choice. 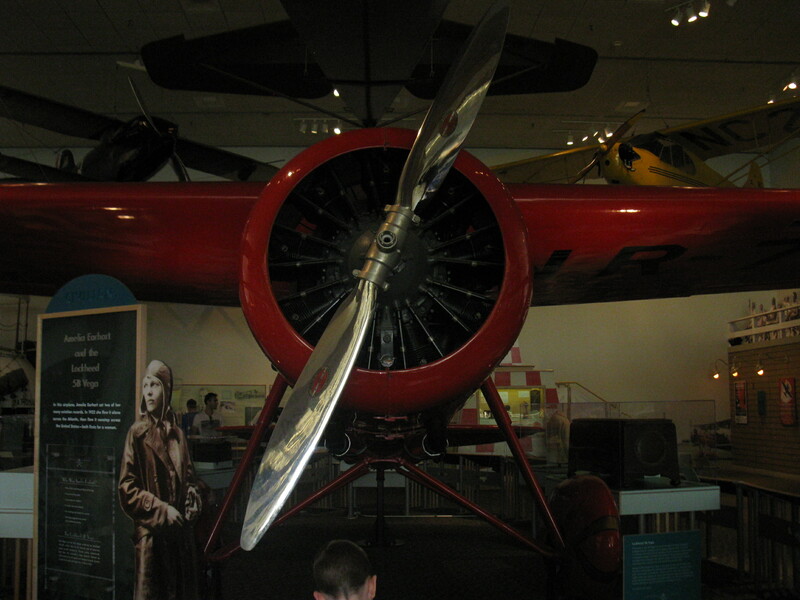 Of course, an Air and Space Museum would only be half a museum if it didn’t also have exhibits on the Air side of things, so that is our priority for our afternoon session. 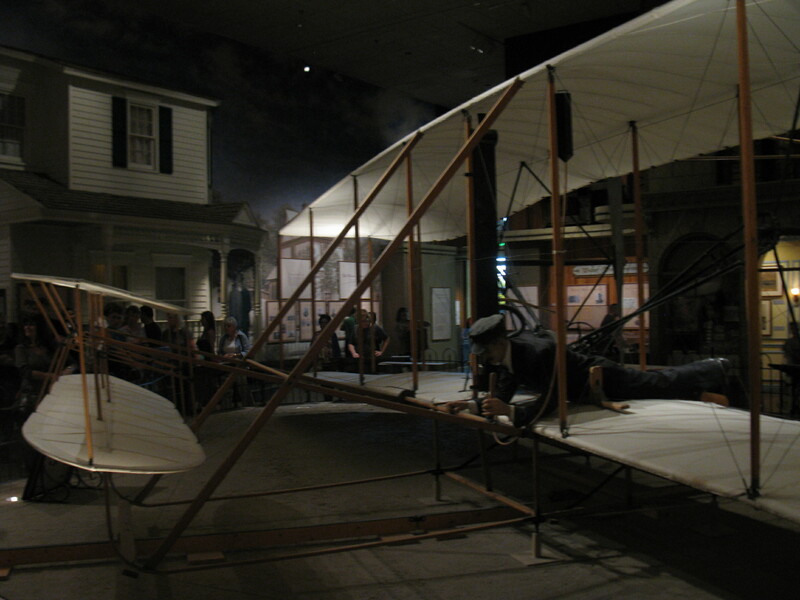 This is equally impressive with comprehensive exhibits on the Wright Brothers and their Flyer, Amelia Earhart, Charles Lindbergh’s Spirit of St Louis, along with more recent endeavours. I can see people taking a very close look at engines, nodding approvingly, and talking a language that I know is English, but I don’t recognise the words. I don’t really speak the language of engines – but I know people who do, and that’s what counts. 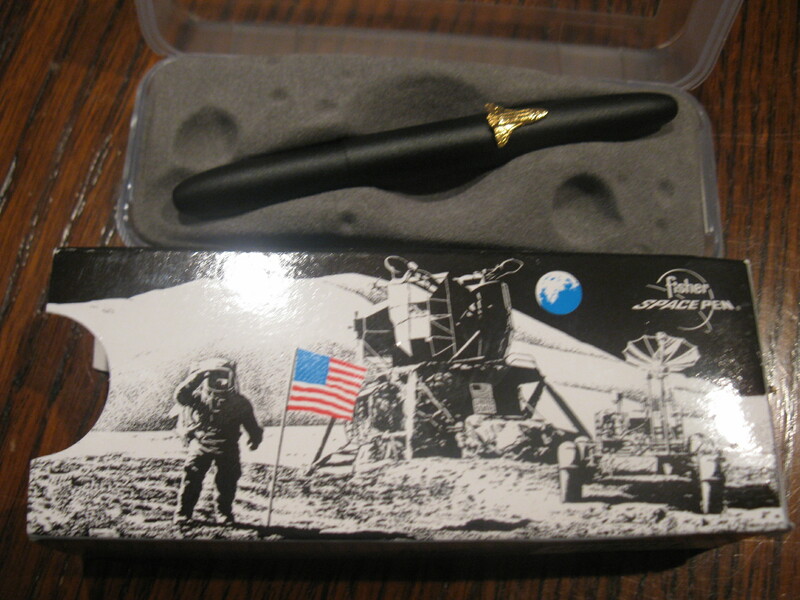 Space pen! Any time, any angle. From previous travels, I’ve learned that heavy pictorial books aren’t great souvenirs unless they are bought on the last day of the trip. Of course we can’t leave the museum without some souvenirs, so we quickly purchase a set of space chess, (ie chess where you can’t recognize what the pieces are, because everything is a rocket, and nothing resembles a bishop or a rook), t-shirts (which are useful because they extend the supply of clean shirts) a space pen (for those annoying moments when your only option is to write when hanging upside-down – maybe in a simulator! ), a thin and light guide book, and the obligatory fridge magnet. For some reason the boys are also given a lot of marbles by the check-out assistant, but they seem to like them. 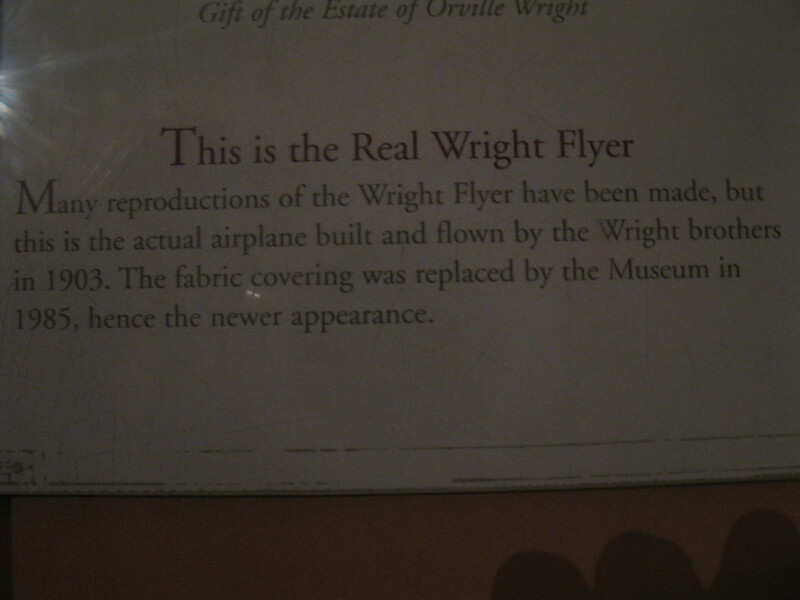 An unexpected souvenir of the Air and Space Museum. (They later change their mind and give these all away to anyone who will take them). And with that, the top line of my list of “must do’s” in Washington now has a metaphoric tick next to it. We’ve had all day at the museum but the boys and I have loved it. A new adventure must now take its rightful place at the bottom of the top five – but ideally one without rats this time. 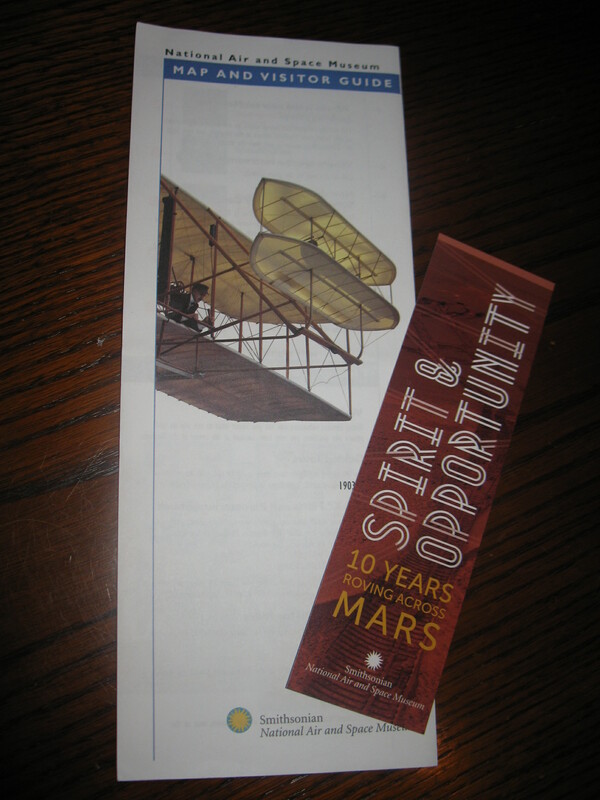 This entry was posted in Travel and tagged Air and Space Museum, amelia earhart, Apollo, Columbia, Curiosity, Einstein Planetarium, flyer, fridge magnet, Gemini, Hubble, John Glenn, lindbergh, Lunar Module, Mars, Mercury, Moon, moonrock, rover, simulator, Skylab, Smithsonian, space food, spacefood, spirit of st louis, Washington, wright brothers, Yuri Gagarin. Bookmark the permalink. my nephew who is 8 would go crazy there, are the boys picture here your boys? very handsome. thank you for passing by my blog and liking my art, and I am going to follow I love music and travel so this blog is cool. Hi Doris – it certainly is a great museum. We could easily have spent more time there. And yes those are my boys. There are better photos of them coming from the Florida leg of our trip!